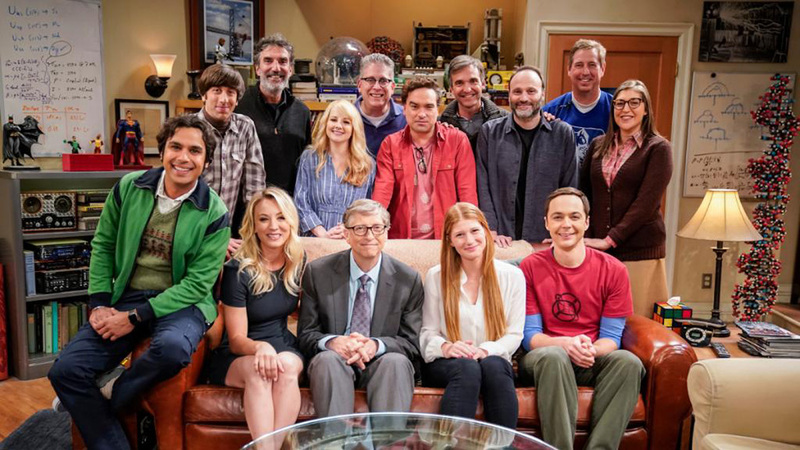 Bill Gates on The Big Bang Theory — Hilariously Makes Leonard Cry! The one and only Bill Gates will be making his debut on The Big Bang Theory tonight, and as expected Leonard, Howard, and Raj cannot keep their cool. The Microsoft founder will be playing himself in the episode titled "The Gates Excitation," and viewers will get a good look at the genius' comedic side. Johnny Galecki, who plays Leonard on the CBS series, gushed about Bill, adding, "Bill was great… He cracked me up during one take. I broke." Kaley Cuoco (Penny) also revealed that the cast and crew could not stop fangirling over the billionaire. "Usually with someone that big, like Bill Gates, we take a group shot on the couch and I don't think I've ever seen that many people with their phones out and cameras to get into this photo with Bill. It was a very exciting day here at Big Bang. According to a synopsis of the episode on TV Guide, Penny gets the opportunity to host Bill at the pharmaceutical company where she works. So while Leonard, Howard (Simon Helberg), and Raj (Kunal Nayyar) do everything in their power to meet him, Sheldon (Jim Parsons) thinks he is the victim of an April Fool's joke and misses out. As expected, Leonard could not contain his excitement and started crying when he met his hero — prompting Bill to offer Leonard a tissue (and hilariously deny his request for a hug). And judging from a recent tweet, we have a feeling Leonard might have used something other than a tissue to wipe his tears during their meeting. "I had a lot of fun at @bigbangtheory. Luckily, I packed an extra tie," Bill cryptically wrote. We guess we'll have to tune in to see what happens. Bill isn't the first geek icon on the popular comedy. Elon Musk, the late Stephen Hawking, astrophysicist Neil deGrasse Tyson, and Apple co-founder Steve Wozniak have all appeared on the show. Bazinga!